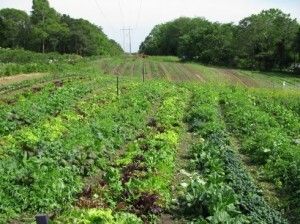 I’ve been picking my own vegetables at Coonamessett Farm this year. It is just down the road from where I live, and I find it both energizing and relaxing to walk through the fields and pick strawberries, peas, string beans, rhubarb, lettuce, beets, cabbage, onions, and other delights. I’ve made lots of salads, a strawberry-rhubarb pie, and cooked vegetables I have never cooked before, like beets, and discovered vegetables I have never used before. Like Swiss chard. I’ve never cooked it before, never really noticed it before, but when I found it growing in the field, so bright and colorful, I decided to give it a try. So, I picked four multi-colored leaves, not quite sure what I would do with them. I checked some recipes when I got home and settled on a variation of simple one, sauteing the leaves with mushrooms, red peppers, and onions. It was as tasty as it was colorful. 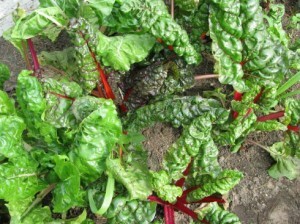 Swiss chard, it turns out, is used much like spinach, though the leaves seem more substantial. 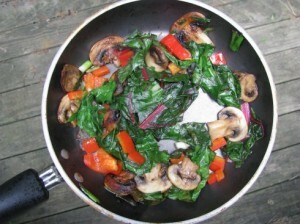 My husband loved it too, so it is likely we will be heading back to the fields for more Swiss chard soon.